Jump to video Can Iraq stand on its own? 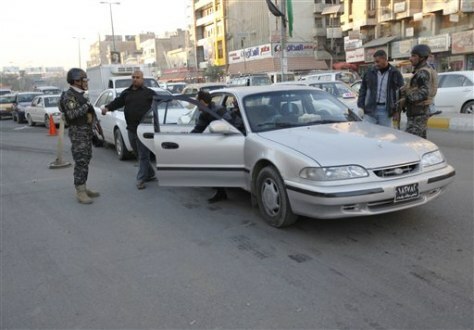 Iraqi security forces search people and cars while hundreds of vehicles are in queue, waiting to be searched, at a checkpoint in Baghdad, Iraq, on Tuesday, Dec. 28. Security officials are investigating the possibility of removing some of the hundreds of checkpoints across the city, in a sign of the improving security situation. The checkpoints are designed to catch insurgents, but they also slow down traffic in the already congested city.